[New for 2017] For a long time, Friendly's has made sundae cups. While the branding and flavor options have changed over the years, the size is basically the same... until now! 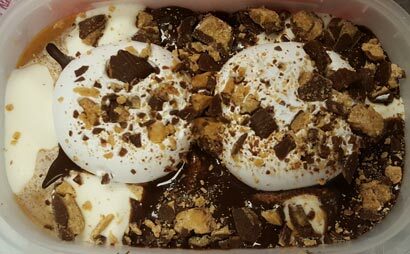 Friendly's is dishing up four humongous sundaes in clear containers. You see, while their gummy "all natural" line up is going after Turkey Hill, this line up seems to be going after Breyers "gelato". It sure looks pretty enough. 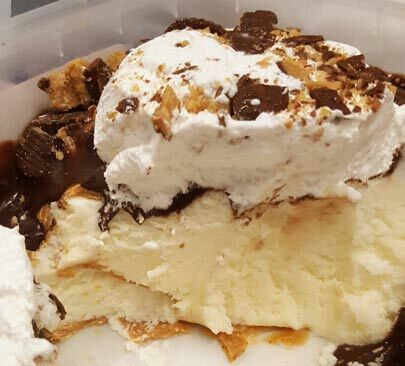 We've got two big mounds of whipped cream and the whole thing is covered in peanut butter cup chunks. It's certainly a neat thing to look at it. Oh, don't forget, you need to let this temper! The toppings need time to get to the right consistency. I dig in and am reminded of Friendly's current level of ice cream quality and texture. It takes things down a notch. Not quite sure how they get away with calling it "premium ice cream". This has been a problem with their sundae cups for awhile though so I'm not really surprised. It appears that the chocolate swirl comes from the top while the peanut butter comes from the bottom (or more likely the pb went in first). This is clever as it allows for a decent ability to get some of each swirl without them being directly mixed. They get to retain their unique tastes, even if neither one is particularly spectacular. The fudge is ok but the pb is a bit dry and potent. The whipped cream is kinda weird, kinda foamy on the first serving. It's more solid than you might imagine, even after being out for awhile. It's not horrible, but it will remind you of something that isnt quite whipped cream. Actually, here's a pro-tip. Just don't eat it by itself. Just get a little bit on your spoon (resist the urge to just eat whipped cream and pb cups). Sounds like I'm bashing this treat right? Yes, but it's not that bad though. What I am actually hoping you take from this is that you need to scoop a bit of each component every time. No one component is all that impressive, but if you get all five parts on your spoon in a decent ratio, you should enjoy this. This is dumb fun. It's not great, but it's fun. On Second Scoop: I just want to stress again the tempering part and the mixing part. I've dug in to this three or four times now and it's just a fun snack. It's important to get a bit of peanut butter cup on your spoon because it's the most enjoyable of the flavors. It's also good to get a little whipped cream on your spoon to balance out the odd texture of the vanilla ice cream. Bit of everything and you should be fine. At the very least, I enjoyed it way more than any Breyers "gelato" I've tried. Dubba how does this compare to their 1.5L container of Peanut Butter cup ice cream? Not sure the last time I've had that flavor, but the idea is that this would be more "fun" because of the fudge swirl and the ability to control what's on your spoon. I wonder why they are so stingy with the whipped topping...it's not like it is high quality and therefore costly. It means that some servings will have very little...I guess someone will have to eat it all at once 😀 I think it would have been neat to add a layer of pb cups and/or fudge between layers of vanilla to break up all the plain ice cream. I'm usually one for less is more with ice cream (toppings I mean, certainly not portion size!) But if it's a fun sundae, go wild. I wouldn't worry about it too much as I haven't run in to any drastic shortages of stuff and I've only got one serving left. I'm not opposed to more pb cups ofcourse, that's just silly talk. There's enough whipped cream as you don't need a ton on your spoon, not sure any more would be necessary. As long as your expectations are in check, that the ice cream base itself is not that great, this is really delicious and a pretty good deal. I haven't tried the other flavors yet, what are the other standouts?